Modern versions of iOS offer a convenient dragging gesture that allows iPhone and iPad users to quickly select multiple pictures from the Photos app, without having to continuously tap on images or use the select by date method. With the iOS drag and select gesture, you can choose as many photos as can be seen on screen, which you can then share, add to folder, move, or perform other actions with. It works very similar to clicking and dragging to select groups of files or images with a cursor on Mac and Windows computers, but given the touchscreen nature of iPhone, iPad, and iPod touch, you utilize a tap and drag instead. Once the multiple images are selected in Photos app, you can share them, transfer via AirDrop to a Mac or other iOS device, move them into different folders, save to the Files app and iCloud, and much more. Like many other gesture related tips, this is one of those tricks that you should try out yourself and learn how it works. Once you familiarize yourself with it, you’ll see just how fast and efficient it is. This drag-and-select trick is obviously limited to what images are visible on screen, so it may be a bit more useful for the larger screen iPhone and iPad models compared to the smaller screens. 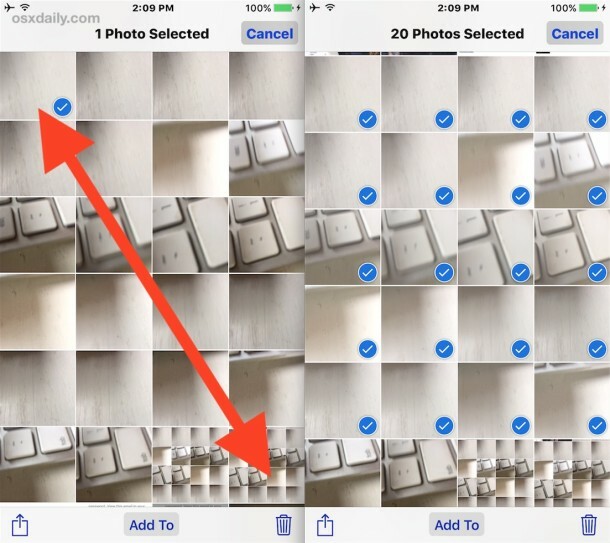 Accordingly, if you’re trying to delete many images from the devices, a better approach is still to use the select all by date trick to bulk remove photos in iOS regardless of the device, since by selecting from date you will also select images that are not visible on screen that are within the date range. Either approach is going to be much faster than tapping multiple photos one-by-one to remove them or perform another action. 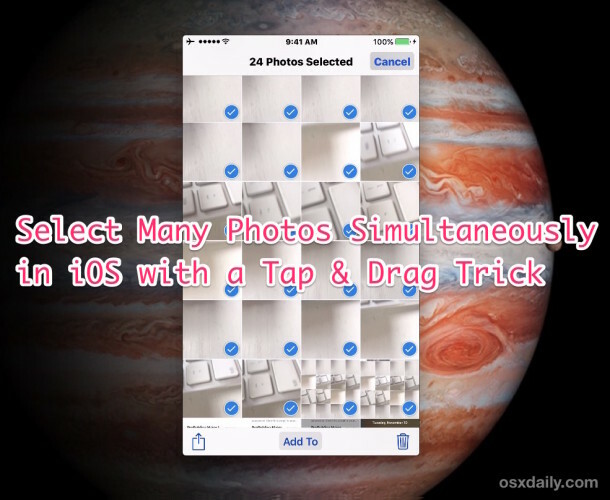 Do you know of any other convenient gestures or tricks to select multiple photos at once on an iPhone or iPad? Let us know in the comments! This is one of my favorite tips by far. Thanks!! I have been looking EVERYWHERE for a way to do this on my macbook. When I am working with alot of images, I end up accidentally double-clicking and opening (and crashing) photoshop or illustrator.So frustrating having to hold down the command key for a long time. Hopefully someone has an idea I can try. It’s different on iPad and iPhone as shown here. On the Mac you just click and drag with the cursor, it’s the same thing. You can hold down the Shift key to select everything as you drag. The Command key to individually select. Like lots of folks, I visit this site each morning. Sometimes the tips are things I know; sometimes, it’s new. But each day I marvel at the task of finding something new and different for readers, day after day, year after year. Thanks for the kind words, and thanks for reading Michael! Not working for me. It simply moves the photo when I drag, does not select several photos. What I am doing wrong? Doesn’t work on my iPad Mini with OS11.4.1 either. Used to work in the past. This works on all iPhone and iPad models, with any new iOS version, including iPad Mini, iOS 12, iOS 11, etc. Tap the “Select” button then tap and drag to select multiple photos in Photos app. Nope, sorry, doesn’t work. It thinks I want to drag the photo to the bottom of the screen. Oh… now I get it. You have to tap on one photo. Then you tap on another, and drag that one, while leaving the first photo selected. The third step listed here is wrong; you have to release your finger off the first one before selecting and dragging a second. Anyhow, thanks for the pointer. I just did it as described. Yes of course it works, but, this is important; you have to follow the instructions. No you do not release your finger. Just tap and drag. Or Tap one picture, hold, drag to others, that’s how you select multiple photos the fastest on iPhone or iPad. It’s a tap and drag gesture. The instructions for how to select multiple photos on iPhone are above the comments section, it requires reading the instructions and then following them as written, it does not involve jumping right to the comments without reading the instructions. Do not jump right to comments to post a comment, this is not Facebook where you type a comment or type out whatever barf thought comes into your distracted brain without thinking about it. Wow! The ‘select all’ button disappeared from my iPhone 5s (and wasn’t there on my new 6s), so I’ve been just selecting all the pictures manually and then deleting them. I was SO annoyed that Apple did away with this (perhaps equally as annoyed that they did away with the ‘delete all photos from device’ that used to be possible within iPhoto). I searched the net but couldn’t find any info on this problem. I was wondering if maybe it was just me! When I saw this tip, though, I was like – duh – Apple just made things more intuitive and natural of course. Anyway, thank you for sharing this tip. As others said, if you move your finger to the bottom of the screen, it will scroll and you can in fact select as many pictures as you want. Honestly, I would still prefer to just ‘delete all’ but this is WAY better than manually selecting. Thanks!